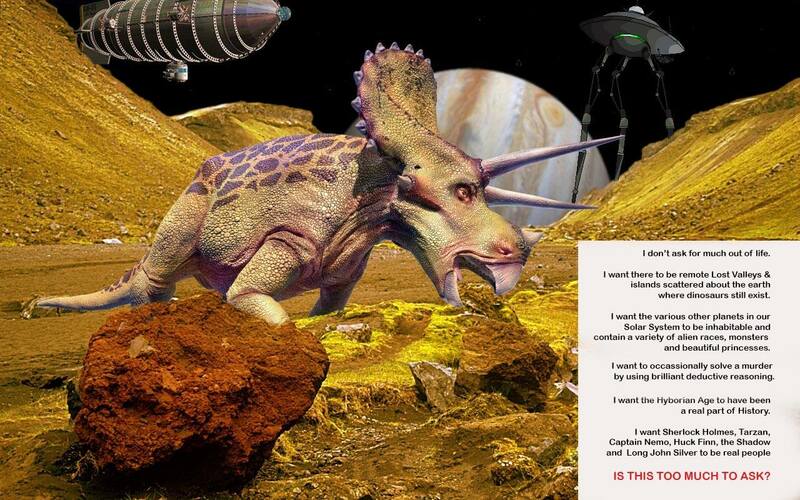 In the 23rd Century, a scientist named Zarrko (aka the Tomorrow Man) is bored with universal peace and harmony. Using a time machine, he comes back to the 20th Century to steal a nuke and have himself some fun. Thor calls on his father Odin for the power to pursue Zarrko back to the future, where he finds the villain has used the threat of the bomb to take over the world. Some tussles with giant robots and death rays quickly ensue. 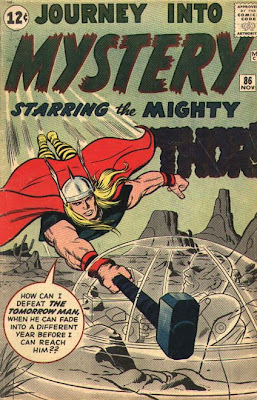 It’s nice that Lee and Kirby continue to remind us that Thor is a part of the whole Norse pantheon. It’s continued to be made clear that Thor has a history stretching back to before he reappeared on Earth as part of a shared identity with Donald Blake. 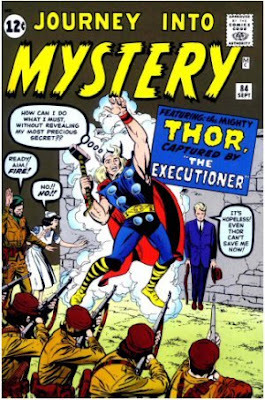 As I’ve stated in previous issues, it’s when Lee and Kirby decide to build on this concept that Thor will get really, really good. Until then, though, we’re still being presented with pretty good plots and excellent visuals. 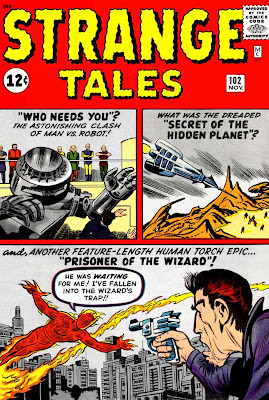 A super-scientist called the Wizard decides to battle and defeat the Human Torch, pretty much just to prove that he can. He manages to capture Johnny and then, wearing a special suit that allows him to simulate the Torch’s powers, he goes on a criminal rampage. But, with a little help from the Invisible Girl, the Torch gains the upper hand in the end. The whole Johnny-has-a-secret-identity thing, a direct contradiction of how he’s portrayed in the FF, is still getting on my nerves. The Wizard’s motivations are weak and his plan is silly. Perhaps the silliest moment comes when he captures the Torch. He’s sprayed the Torch’s body with water. Only the Torch’s head is still flamed on, preserving Johnny’s secret identity. All the Wizard has to do is spray a little water on Torch’s head to find out who he is. Instead, he goes through a complex plan to discredit Johnny and blackmail him into revealing is identity. AS IF JOHNNY IS EVEN SUPPOSED TO HAVE A SECRET IDENTITY!!!! Oh, well, at least we get another regular FF villain onto the scene. Though the Wizard doesn’t acquit himself very well this time around, he’ll eventually build himself up into a reasonable threat in future issues of the Fantastic Four. Next time, we’ll start our look at December 1962. Namor comes back to bother the FF; Johnny continues to get on my nerves; Ant Man meets the closest thing to an arch-enemy he’ll ever have; and Thor takes a thematic step backwards to battle Communists. I love continuity. I love it when a fictional universe—be it from comic book, prose or film—maintains its own consistent internal logic. Middle Earth is like that. So is Narnia and Robert E. Howard’s Hyborian Age. Future History SF novels by Poul Anderson and Larry Niven are also good examples. DC and Marvel comics used to do this, but have quite sadly tossed away all sense of internal continuity in recent years. In fact, I love continuity so much, I even apply it to situations that don’t really need it. Take the three Sinbad movies made between 1958 and 1977 by stop-motion animator Ray Harryhausen. In each of these movies, Sinbad has to at some point rescue his one true love from danger. The trouble is that each movie has a different true love. The first time around, it’s the princess of Baghdad. Second time out, it’s a slave girl he acquires, then sets free. The third time, it’s another princess—this time from the city of Charak. Also, none of the actors playing Sinbad come even close to looking like each other. So, of course, the most sensible thing to do is simply presume the three movies are set in three separate but similar universes, in which parallel versions of Sinbad are having their own adventures, with each finding his one true love. But, gee whiz, what fun is that? After all, with the special effects being done by the same guy in each film—and said effects being the heart of each film—isn’t there a way we can jam the stories into the same universe? Well, of course there is. One way might be to presume that Sinbad’s ladies keep dropping dead of the Black Plague or something between movies. But Sinbad is a high-adventure, swashbuckling-type hero and that sort of inherent tragedy just doesn’t seem to fit him. So let’s take another route. We’ll start with 1958’s The Seventh Voyage of Sinbad. Kerwin Mathews stars as the heroic sailor, battling a couple of Cyclops, a dragon, a skeleton and a few other unlikely creatures in order to save his girl friend from a curse. It’s a wonderful movie, with the look and feel of a fairy tale. 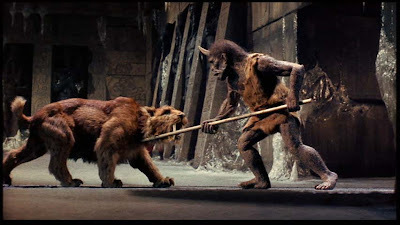 Mr. Harryhausen’s stop-motion creations have real personality to them and Sinbad’s sword duel with a skeleton is perhaps tied with a Cyclops-dragon fight as the visual highlight of the film. Sinbad rescues his lady in the end and they get married. Presumably, Sinbad is now a prince of Baghdad. So let’s now presume that Sinbad has a son. Sinbad II grows up and, taking after his dad, becomes a skilled sailor and leader of men. But Sinbad II doesn’t want to just kick back and inherit his wealth and position. He wants to earn his own way. So, with his father’s blessing, he sails away with his own ship and crew to seek his own fortune. That leads us up to 1974’s The Golden Voyage of Sinbad. This is my personal favorite of the three Sinbad films—perhaps because it’s the first Harryhausen film I saw in a theater. But it’s also got a good cast, with John Philip Law the most authoritative of the Sinbads and Caroline Munro looking beautiful enough to make most men’s eyeballs melt right out of their sockets. Tom Baker—who would soon after play my favorite Dr. Who on the British television series of that name—does a highly entertaining turn as the villain. The movie’s got a well-constructed plot as well, involving a quest to be the first to find a valuable treasure. 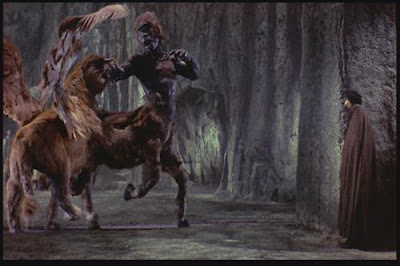 The visual highlight is towards the end, when a gigantic cyclopean centaur fights a griffin, then goes up against Sinbad and his men immediately afterward. Anyways, this Sinbad marries Caroline Munro after the movie ends—the lucky dog. They have a son, Sinbad III, who grows up to look like John Wayne’s son Patrick. Sinbad III falls in love with the princess of Charak. (Apparently, Sinbads fall in love with royalty on alternate generations.) But when the princess’s brother is turned into a baboon, Sinbad immediately goes on a quest to find a cure. Sinbad and the Eye of the Tiger (1977) is the weakest of the Sinbad movies. Patrick Wayne doesn’t seem to be having as much fun in the role as Mathews or Law and there is some weak storytelling inherent in the script. 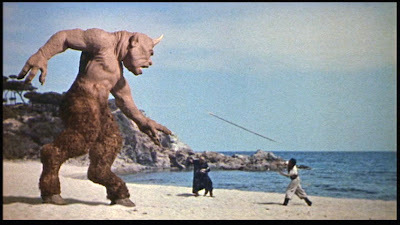 But Mr. Harryhausen’s monsters are still too cool for words. The climax, involving a fight between a giant troglodyte and a saber-toothed tiger, is among his best work. So Sinbad III returns from his quest and marries his lady love. (Who, by the way, looks like Jane Seymour. How lucky can a Sinbad be?) Did they produce a Sinbad IV? One would hope so. The world can never really have enough Sinbads. Gee whiz, the Puppet Master is one creepy looking guy. He’s got a creepy M.O. as well, using radioactive clay to make puppets of real people, who he is then able to mentally control via the puppet. This is really Ben Grimm’s issue. He meets the love of his life---Alicia Masters, the blind step-daughter of the Puppet Master—and takes yet another major step to leaving aside his bitterness and accepting life as the Thing. 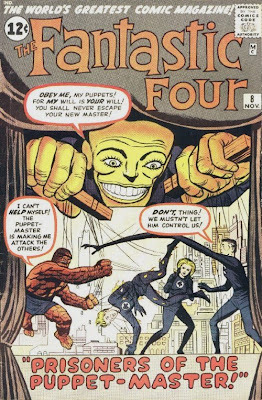 In the meantime, there lots of mental control; lots of breaking free from mental control; and lots of good action as the FF deals with a mass prison escape; all leading up to the Puppet Master falling to his (presumed) death. He’ll be back, though. The Puppet Master will prove to be a fun enough creation to call for an occasional return appearance. When we last saw Hulk and his only friend, teenager Rick Jones, we weren’t certain if big guy would ever again turn back into Bruce Banner. But we need not have worried, as Rick manages to use some some of Bruce’s hidden equipment to turn him human once again. In fact, the situation really changes as Bruce briefly retains his own personality and intelligence when he becomes the Hulk once again. 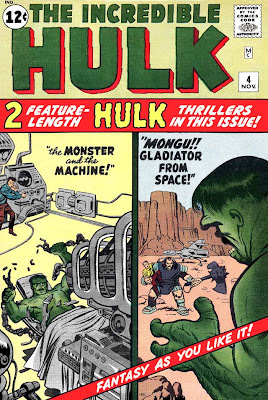 But the Hulk’s more savage personality reasserts itself in time for him to fight Mongu, the Gladiator from Outer Space. Mongu turns out to be a robot operated by a Communist soldier as part of a plot to capture the Hulk for study behind the Iron Curtain. That proves to be a really bad idea. By the end of this issue, Bruce is able to use machinery to turn into the Hulk as needed, then back to a human being again. It seems that Lee and Kirby are still playing around with the character, not yet sure what works best as they try out different things. The Hulk, at this point, is still very much a work-in-progress. The Protector, clad in a mechanical suit to amplify his suit and wielding an apparent disintegrator pistol, is forcing local merchants to cough up protection money. Ant Man looks into things and, despite at one point being vacuumed up by the bad guy, manages to put a stop to the racket. There’s really not much to say about this issue (a situation that will probably reoccur when we cover future Ant Man stories). The Ant Man is a perfectly good character and the stories are entertaining, but this comic simply isn’t reaching the same level of originality and character development that we are seeing in the Fantastic Four (and will soon see in Spider Man). I don’t want to sound like I’m dumping on the story or the character---it’s still good stuff. Just not truly great stuff. 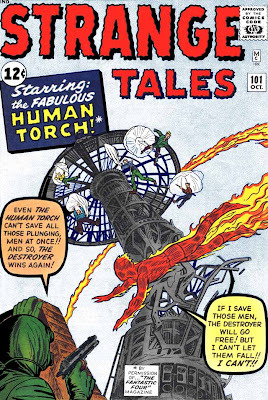 Next week, we’ll visit with Thor and the Human Torch to finish up November 1962. It's embarassing to admit it, but until just a few nights ago, I'd never watched The Man Who Shot Liberty Valance in its entirety. I'm supposed to be a classic black-and-white movie guy. I'm supposed to be a huge fan of director John Ford, who could compose a scene on screen with a higher sense of artistry and beauty than pretty much anyone else ever. I'm supposed to be a fan of both John Wayne and Jimmy Stewart Westerns. 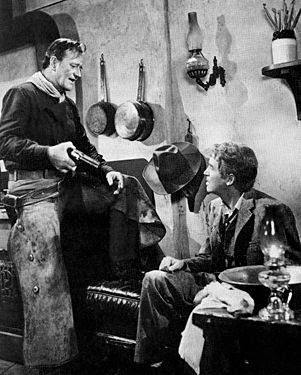 But I had never before seen The Man Who Shot Liberty Valance straight through. It was downright embarassing. Well, I've fixed that by popping the DVD into my laptop the other night. Of course, I know about the film because it's impossible to know anything about classic films without knowing about this one. So I'm not surprised that it turned out to be every bit as good as it's reputed to be. Its highly intelligent, multi-faceted script is backed up by great performances, direction and photography. It's also got the most loathsome villain ever to appear on film. Lee Marvin plays Liberty Valance as a violent bully, without a single apparent redeeming quality. All the same, Valance seems like a real person (and consequently, a real threat). Marvin is always memorable in villain roles--endowing such characters with individual (if evil) personalities. He also does a great death scene when he's shot, staggering about just a little bit before finally collapsing. This was typical of the actor as well--watch him in Seven Men from Now and The Comancheros to see other examples of how Lee Marvin looks cool even when he was dying. Marvin's sidekicks in Liberty Valance are played by Strother Martin and Lee Van Cleef, two of the many great character actors that used to give American films so much heart. Martin is a sadistic little runt in this movie, letting out a high-pitched laugh whenever the perpetually angry Liberty Valance starts whipping someone. Van Cleef is the guy who has to pull Valance away from the whipping and remind him it's time to leave--we never get the impression that he feels sympathy for Valance's victim, merely that he's being practical. These guys just aren't taking up space in front of the camera--like Valance, they are giving their characters real personality. It all helps add to the versimilitude of the movie. One other actor deserves mention--Edmund O'Brien plays Dutton Peabody, a drunken but still honest newspaperman and (eventually) reluctant politician. O'Brien really hams it up in this role, but also makes Peabody likable and--despite the character's many faults--worthy of our respect. I'm glad I finally got around to seeing this one straight through. Loki escapes from Asgard and locates Thor on Earth. He briefly succeeds in hypnotizing the Thunder God, but Thor is soon himself again, resulting in a well-illustrated chase through and over New York City, with various acts of magic and feats of strengths tossed into the mix. Finally, Thor sends Loki back to Asgard in abject defeat. This was a fun and important new direction for Thor to take. Not only does he meet his arch-enemy, but it’s established that he is literally a part of the Norse Pantheon. This will gradually open up storytelling directions that will allow Jack Kirby’s magnificent art to reach new heights of imagination. When this story opens, we find out that Sue Storm and her brother Johnny live (at least when not on missions with the Fantastic Four) in the suburb of Glenville. Everyone knows Sue is the Invisible Girl, but no one suspects Johnny is the Human Torch. Huh? Waitaminute—over in the FF’s book, none of the four have secret identities. 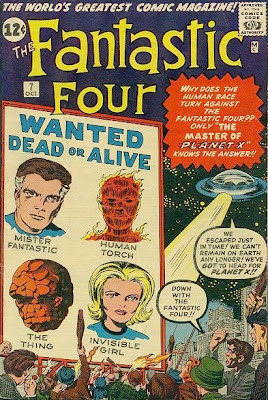 None of them wear masks and, in fact, in this month’s issue of Fantastic Four, they all appeared at a nationally televised ceremony at the U.S. Capital. Including Johnny. Without a mask or anything to hide his identity!!!!! But in Glenville, nobody suspects Johnny—the sister of the Invisible Girl—is the Human Torch. The general population of Glenville seems to be a few bricks shy of a full load, don’t they? It’s a continuity glitch that will annoy me to no end throughout this series. In this story, someone is trying to sabotage the rides at a new local amusement park. Johnny keeps having to cause silly distractions so he can flame on without anyone noticing, allowing him to save the day when the rides start to act up. Eventually, he figures out who the mastermind behind the sabotage is and reveals it all to be yet another Communist plot. Blah, blah, blah. Oh, well. As the series progresses, there will be some fun stories and we’ll get to meet some villains who will later go on to tangle with the entire Fantastic Four. Next month’s issue, in fact, will introduce us to the Wizard, who will eventually found the Frightful Four. With this entry, we’ve covered the first full year of the Modern Marvel era. So far, the world has met the Fantastic Four, Hulk, Ant Man and Thor. Spider Man has made his debut, but his return to superheroics is still a few months away. Important villains so far introduced include Dr. Doom, Mole Man, Loki and the Skrulls. Prince Namor, originally created in 1940, has returned to take part in events once again. We’ve been invaded by aliens on at least three occasions and the U.S. seems to be infested with more Commie spies than you can shake a canister of reducing gas at. Next week, we’ll start our look at the second year of Marvel heroics. Thor will take a trip to the future; the Fantastic Four (via their own book and the Human Torch’s solo adventures) will add a couple more villains to their rapidly growing rogue’s gallery; the Hulk will deal with some more of those pesky Commies; and Ant Man will take on a protection racket. Avenging your dad and regaining your throne--all via the roll of a die. I'm not immune to the appeal of computer games. I've got a couple for my laptop (the only computer I own) and I've wasted a lot of time at a local comic book shop, blasting away at Nazis in Call of Duty 2. But I still prefer board games to computer games. And if I can't find a live opponent, I'll occassionally break out one of several well-designed solitiare board games I still have kicking around my home. 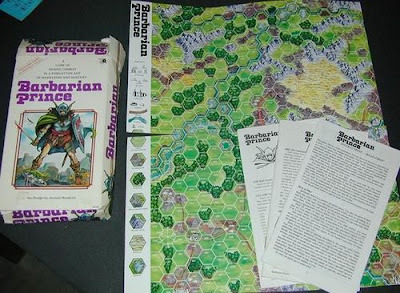 One of the nifter ones is Barbarian Prince, which was published in 1981. In this game, you play, well, a barbarian prince whose father has been murdered by usurpers. You escape with nothing but your sword and a few gold pieces. You have 10 weeks in which to raise 500 gold pieces in order to hire an army to regain the throne. Take any longer and your enemies have gained too much strength to defeat. Each turn represents one day and allows you to move one hex (farther if you have a mount) on the map. Every time you move, you roll dice to check to see if you got lost, then check to see if you encounter something. You also have to buy or hunt for food. It's the variety of possible encounters that make the game fun. There's a booklet full of them and each individual encounter can have a number of possible outcomes. You might run into a drawf, for instance. The drawf might then do anything from attack you to join you to simply ignore you. Perhaps you spot a herd of wild horses and then have the option of spending a day catching and training one of them. Perhaps you'll be attacked by a pack of wolves. Perhaps you'll run across an isolated farm, then must decide to bypass it, attack and loot it, or simply make nice and maybe buy some food. If you reach a ruins, you can search it for treasure. You may indeed find a treasure. But you might also get attacked by orcs, stumble across a dragon or have an ancient crumbling wall fall on top of you. If you reach a town or castle, you can appeal to the local lord for help, but he might just get annoyed with you and toss you in his dungeon. Maybe you'll hear a rumor of a buried treasure or maybe the priestess at a temple will fall in love with you (giving you an opportunity to run off with both her and the temple jewels). Sometimes you'll build up a motley crew of followers to help you out. More often than not, though, you'll trudge through the wilderness alone, depending on your wits and your sword to see you through. The game is simple in its mechanics and the map is well-designed. A lot of dice rolling is required to generate encounters, but the game overall has real personality to it. Whenever I get in the mood to play, I usually end up running through it 8 or 10 times. It's hard to win--dying a horrible, lonely death is the usual outcome. But that keeps it challenging and, hey, no one ever said being an exiled barbarian prince was easy. In this issue, the FF are kidnapped and taken to a doomed planet about to be hit by an asteroid. Reed is asked to come up with a way to save the five billion inhabitants. There’s some nice moments of interaction between the main characters here—most notably in that Ben Grimm is still growing less overtly bitter (though he still remains perpetually grouchy) and he’s starting to show his sense of humor. Kirby’s layouts are typically fun; the plot unfolds logically; and Reed’s solution to the problem at hand is actually very clever. In a way, though, this issue is just filler as we await yet another major addition to the cast of the Fantastic Four. Because it will be in issue #8 that Ben Grimm will find himself a girlfriend. As this issue begins, Ant Man is helping the police to open a bank safe in which two would-be robbers have been trapped. We discover that between issues, Ant Man has been helping out the cops and the Feds quite a bit, mysteriously showing up whenever he’s needed. He’s got ants all over the city alerting him to trouble via his cybernetic helmet. He then shrinks down, stuffs himself into a miniature catapult and shoots himself to wherever in the city he needs to be. A bunch of ants wait for him at his landing point, cushioning his fall with their bodies. It’s odd how we as individual readers react at different levels of willingness to suspend disbelief. I’ve got no problem with shrink gas and electronic communications with ants, but that catapult gets on my nerves. I don’t think I can even explain why—it just does. Oh, well, before too many issues go by, it’ll be phased out. 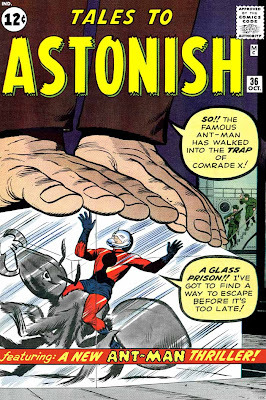 Anyway, the main plot involves Communist agents trying to lure Ant Man into a trap. Not a bad story, but not really that memorable either. 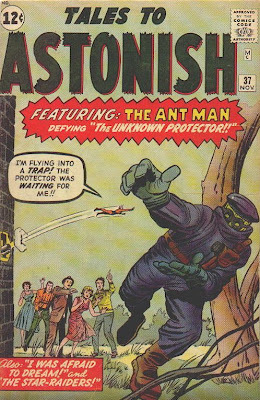 Though the Ant Man stories will continue to be entertaining for what they are, the lack of memorable or challenging villains will continue to be a flaw in the series for quite a while. 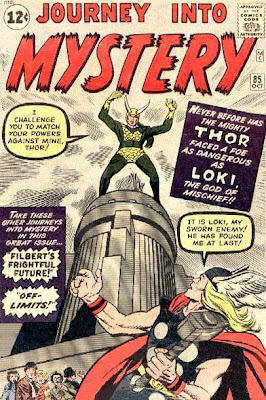 Next week, we’ll finish off October 1962 with a look at what Thor is doing to keep busy, and we’ll also follow along with a member of the Fantastic Four on his first solo adventure. How do you get from the Transporter Room to the Bowling Alley? I love blueprints and cutaway images of fake stuff. The seven-year-old still buried not all that deep inside me loves the opportunity to figure out how to get from, for instance, the Intergalatic Zoo inside Superman's Fortress of Solitude to the room where the Phantom Zone projector is located. Hey, you never know when this sort of information might save your life. I've got a blueprint of the Fortress of Solitude in the recently-reprinted "Superman Encyclopedia." I've got a blueprint of the Millenium Falcon in the rulebook for an old version of the Star Wars Roleplaying game, so if Han Solo ever needs me to man one of the gun turrets, I'm ready to go. I've got blueprints of the submarine Seaview from Voyage to the Bottom of the Sea, so if Captain Crane or Admiral Nelson ever need me to report to the Flying Sub or the missile room or the circuitry room or wherever, I'm there. I've got blueprints of a small Klingon spaceship. Some years ago, my nephew (then maybe 7-years-old or so) and I planned out alternate escape routes from the brig to either the shuttle bay or the transporter room. We even figured out how to raid the small arms locker along the way. So if we're ever captured by Klingons, we're ready to deal with it. 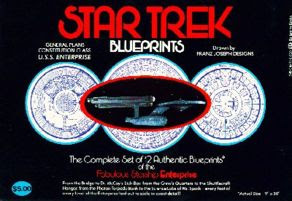 My favorite blueprints, though, are a set I've had since I was a little one--those of the original Star Trek Enterprise. Gee whiz, these are cool. It maps out the entire ship for you (including the bowling alley located on Deck 21) and breaks down the number of crewmen stationed aboard her by rank and specialties. By golly, if I ever need to find my way from the bridge to the sick bay or transporter room or the photon torpedo tubes or the Cosmology lab on Deck 3, then I'll be able to get there. No problem. And to this day, I remain convinced that this information will indeed one day save my life. While Ant-Man was battling commie spies here in America (see last week’s entry for details), the Mighty Thor was dealing with commie insurgents in South America. We get a little bit of character development first. We learn that Dr. Don Blake is in love with his nurse, Jane Foster. But he can’t tell her because he’s convinced she could never love “a… a lame man.” Jane, in the meantime, is secretly in love with Blake, but won’t tell him because she’s convinced he’s not interested in her. Okay, enough with the romantic gobbledy-gook. Let’s get to the superhero action. Blake and a contingent of medical personal (including Jane) volunteer to go to a war-wracked South American country to provide aid. But the leader of the communist army there doesn’t care for that idea, so he sends planes, tanks and men to wipe out the aid workers. Thor keeps showing up to foil the attacks, though. Jane gets captured, forcing Blake to allow himself to be taken as well to get close enough to rescue her. In the end, the communist leader is shot by his own men. All perfectly good stuff—but Thor still isn’t anywhere near finding his thematic “voice.” There’s still no hint that Blake actually IS Thor (rather than just gaining his appearance and powers when he whacks his walking stick on the ground) and the communist forces don’t really pose much of a threat for him. But Thor will get where he needs to be before too long—just be patient. For the first two issues, Bruce Banner was turning into the Hulk at night, then reverting again to Banner at dawn. But Lee and Kirby may have realized this was too limiting in terms of story potential. 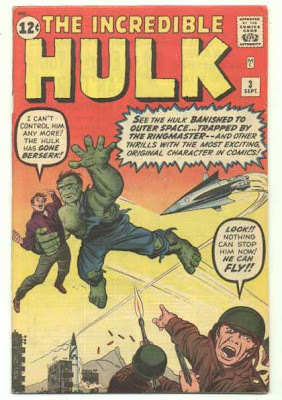 So they begin this issue with the Army tricking the Hulk into a rocket and shooting him into space. Hulk’s friend Rick Jones manages to get the rocket back to Earth, but not before Hulk is zapped with enough radiation to change shake things up. Hulk remains Hulk even after the sun rises. In fact, throughout this issue, we don’t know if he’ll ever turn into Banner again. In the meantime, Hulk is captured by the Ringmaster and his Circus of Crime, who use mass hypnotism to loot the towns they play. By the end of the issue, the Hulk has escaped and the bad guys are rounded up by the FBI. But what is poor Rick Jones supposed to do with a Hulk that isn’t planning on ever turning human again? That’s a problem to be tackled in the next issue. This story was a bit uneven—jumping awkwardly from one story element to another—but Lee and Kirby demonstrate that they are willing to play around with the character until they can refine him into a truly successful creation. That’s it for September. October will bring us the further adventures of Thor, Ant-Man and the Fantastic Four. Also, one of the FF will have the first of many solo adventures.